Giving a nod to Annapolis heritage, the namesake honors the Bay Ridge & Annapolis Railroad that connected the greater Baltimore/Washington DC area with the Annapolis resort town of Bay Ridge, MD. Today, Bay Ridge is a beautiful waterfront neighborhood that embodies Chesapeake Bay living at its finest. Located on a peninsula, it offers grand bay vistas, including constant boat traffic and the iconic Chesapeake Bay Bridge. 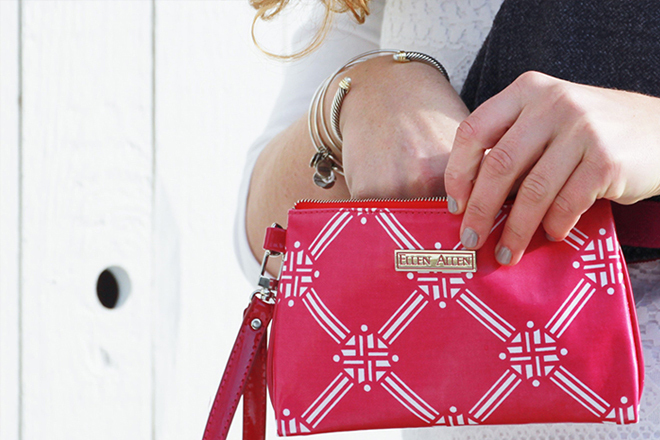 The Bay Ridge wristlet is perfect for travel at a moments notice. Featuring a detachable handle, it is the perfect size for all your essentials….grab your phone, ID, lip-gloss and go! Boxwood pattern available in Union Blue, Paca Pink, Tucker Green, Essex Orange and Steele Navy.